The past is ever present in Sera Davies’ new documentary Namatjira Project, its tragedy haunting the frame, its possibilities opening up the future. In the film’s first moments, grainy images of Indigenous artist Albert Namatjira’s funeral in 1959 are intercut with scenes from a contemporary stage play, Namatjira (2010), celebrating his life. This moving film is the result of an eight-year collaboration between the arts and social change organisation Big hART and Namatjira’s descendants. It is also the story of a meeting between black and white cultures that is inspiring in its potential, even as it is coloured by an all too familiar Australian tale of exploitation. At the heart of the film are two friendships. The first, between the artist Albert Namatjira and his mentor Rex Battarbee, is evoked through archival footage and voice recordings of the pair. Battarbee, a World War I veteran, severely wounded and traumatised by his experiences in France, embarked on a series of extended tours in outback Australia during the 1930s, looking for landscapes to paint. 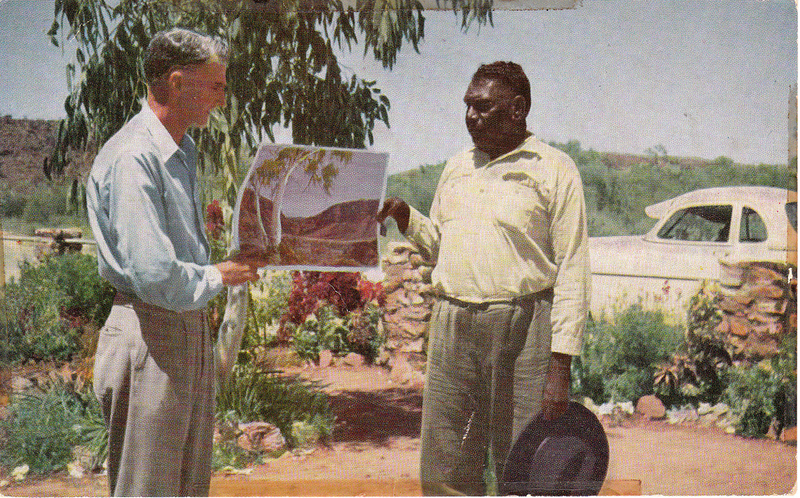 Namatjira encountered Battarbee’s work in 1934, when the artist exhibited in the remote Northern Territory town of Hermannsburg (Ntaria). 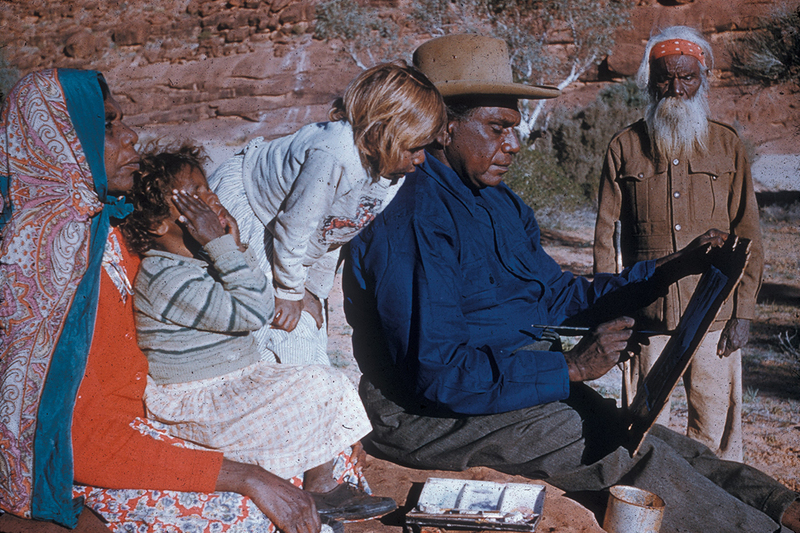 Two years later, Battarbee returned and took several trips into the surrounding desert with Namatjira, teaching him the basics of oil painting. It was the only training Namatjira ever received, yet by the late 1930s, with Battarbee’s help, his extraordinary landscapes were being exhibited and sold in Australia’s major cities. Namatjira achieved considerable fame, met the Queen and was the first Indigenous person “granted” Australian citizenship — an “honour” the artist unsurprisingly regarded with ambivalence. The astoundingly frank racism of the era is shown in a newsreel detailing Namatjira’s visit to Sydney’s Taronga Zoo at the height of his fame in the 1950s. The presence of “a full-blooded native,” the newsreel narration proclaims, provoked a clear reaction in the animals — “especially the apes” who recognised a fellow “descendent of the jungle.” Despite such widespread attitudes in Australia at the time, Namatjira and Battarbee remained close friends until the former’s death in 1959. Between these sounds and images of the past, the documentary traces the development of the contemporary Namatjira stage production by the writer-director Scott Rankin and Indigenous performer Trevor Jamieson, working with Namatjira’s family. The intimate artistic partnership between Rankin and Jamieson neatly mirrors the friendship between Namatjira and Battarbee, illustrating the wondrous possibilities generated when individuals from different cultures open their hearts, minds and knowledge to one another. This is no simplistic feelgood yarn. Davies’ film is frank about how fraught the meeting of black and white cultures can be, and how difficult it is for even the warmest friendships to transcend the power imbalances and institutional racism woven into Australian life. The entire Namatjira Project — encompassing the stage work and film — has been driven by the desire of the artist’s descendants to regain control of Namatjira’s work. Despite copyright on his paintings being bestowed by Namatjira to his family in his will, the Northern Territory Public Trustee sold these rights to the Sydney-based Legend Press in 1983, for just $8,500. This single transaction has left Namatjira’s family in dire poverty, while the artist’s estate has generated millions of dollars. The collaborations around the creation of the Namatjira stage production portrayed in Davies’ documentary are also difficult, informed as they are by the copyright controversy, the wider history of Indigenous dispossession and complex politics within the Aboriginal community. One of Namatjira’s relatives, for example, expresses disquiet to camera about Trevor Jamieson playing the artist, feeling that the actor comes from the wrong cultural background. Davies’ camera also captures the tense discussions with Namatjira’s relatives about the representation of the artist’s final years, during which he endured the pressure of having to support 600 members of his extended family. Clearly, the fruits of cross-cultural collaboration are potentially rich, but the process requires patience and understanding that can only be attained over time. Namatjira Project echoes an earlier documentary in a similar vein, Catriona McKenzie’s Mr Patterns (2004; see RealTime 62), which traced the friendship between art teacher Geoffrey Bardon and the Central Australian artists of Papunya in the 1970s. The fruits of that friendship were also marred by exploitative practices in the wider Australian art world. Indigenous painting is one of this country’s great contributions to the visual arts, and like so much of our history, it is a field rich with little-known stories of cross-cultural collaboration — and the exploitation of Indigenous talent. Big hART’s Namatjira Project relates a fascinating slice of our history through a complex, multilayered story. It is also a tale about cultures connecting in ways that can enrich, as with this project, but, when mishandled, can be highly destructive. The film shows us that non-indigenous Australia has much to learn, and how we might begin to open up to that process. Addressing historical wrongs like the selling of Albert Namatjira’s copyright would be an excellent place to start. Read more about Namatjira Project. Namatjira Project, director Sera Davies, producer Sophia Marinos, featuring Trevor Jamieson, Derik Lynch, Kevin Namatjira, Lenie Namatjira, Scott Rankin; Big hART, 2017. Currently screening nationally.